There is every reason to buy and install kitchen countertops Dallas. Apart from giving your kitchen the design and appeal it deserves, they also increase the overall value of your home. The latter is definitely a worthy investment, especially if you plan to put out your house on the market. However, not every homeowner understands the importance of buying kitchen countertops from fabricators. That is because most of them would prefer to move forward with home improvement stores. Well, sad to say, this is a very bad move. And if you are planning to do the same, then you better continue reading. Below is a list reasons not to buy from home improvement stores. Buying slab layout from home improvement stores for your Dallas’ kitchen countertops project will only give you a headache. Unlike the low-volume production courtesy of home improvement stores, fabricators will always allocate more time to spend with customers, perform “slab layouts,” and ensure that the most beautiful areas of the stones are included in your kitchen, not some else’s. That is customer service at its finest! Did you know that there are over 350 different types of granite and marble available to you? Natural stone can be a “work of art” that comes from all over the globe. At home improvement stores, you will be presented with only a fraction of the said number. Many of these selections are considered within the industry as “commodity granite” for their uniformity. With a fabricator, you are guaranteed to have a vast selection of Dallas’ kitchen countertops, giving you flexible access so you can make the right decision. At the end of the day, you want to have as many options as possible, so you can make sure that you will find the perfect countertop. Do home improvement stores measure, cut, polish, and even install your kitchen countertops? Sadly, they do not. If you sign a contract with them, they will outsource the job to another 3rd party fabricator. In many cases, that fabricator will outsource the installation to a 4th party installation company. Now ask yourself this question. If there is a problem along the way, who do you call, the store, the fabricator, or the installer? This potential confusion alone is enough to consider contracting with a local granite countertop fabricator who has their own installation team. If you are still likely to buy from home improvement stores, call us first at Hard Rock Imports. We fabricate kitchen countertops at affordable rates. We encourage you to have a look-see at our samples and let our experts explain to you the benefits of working with us. Give us a call now! Hard Rock Imports offers high quality quartz countertops, marble countertops, and granite countertops design, fabrication, and installation in the Dallas and Plano Texas areas. 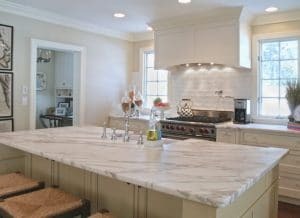 We have over 40 years of combined experience in both natural stone countertops and engineered stone countertops materials like quartz. Our high quality craftsmanship includes our impressive mitered edges and near invisible seams. We at Hard Rock Imports custom countertop design, fabrication, & fnstallation strive for 100% Customer Satisfaction with all clients. We offer an Unmatched Customer Service experience and back our services with 100% Customer Satisfaction Guarantee!